What has better fuel economy than the Honda Fit and a better performance than the Chevy Cruze? You guessed it: the new 2013 Ford Fiesta! Phoenix area car shoppers are in luck because Peoria Ford has one of the best selections of Fiestas in the entire state of Arizona. We want our customers to have the best ownership experience possible and that starts with having the right car. To help you figure out what vehicle is best for your lifestyle, Peoria Ford offers an extensive gallery of Ford model reviews and car comparisons. Scroll down below to read a full review of the new Fiesta now! Our reviews include all of the details you want to know. Find out what's under the hood of the Fiesta, what features come standard in the cabin area, and what safety mechanisms will keep you safe each and every day that you're on the road. When you learn more about this award-winning small car, you'll know why so many people own the 2013 Ford Fiesta in Phoenix, Tempe, Mesa and other surrounding cities. Find out what the hype is all about - scroll down now to start reading! When comparing the 2013 Ford Fiesta head-to-head with the 2013 Toyota Yaris, Honda Fit and the Nissan Versa, and you'll realize that the Fiesta ranks above those autos in various aspects. Scan just a few of the reasons below. Don't go to a megacorp auto repair center in Phoenix, AZ when Peoria Ford's phenomenal repair techs are just a quick trek away; plus you'll get a lengthy warranty on every repair and access to reliable OEM products. Fords in Phoenix can take a pummeling, so turn to the auto repair pros in Phoenix - Peoria Ford. Just a fraction of the work our Ford repair team do includes wiper blade replacement, shock and strut repair and easy ordinary inspections. It's obvious: If you want pros service and inexpensive repair prices in Phoenix, make Peoria Ford your first stop for Ford vehicle maintenance. Get specials on our website. You can view and print out discounts by clicking the following line of text. That culminates our review of the 2013 Fiesta, now available at Peoria Ford. We're sure you've learned many things, but we'd like to reiterate one truly important piece of information. That is the Fiesta's impressive fuel economy, which tops that of rivals like the Chevy Cruze, Honda Fit, Hyundai Elantra and several other vehicles in the affordable small car category. Getting 39 MPG on the highway is a big convenience, not only because it'll save you money, but also because it'll save you time, since you won't be making nearly as many trips to the gas station. 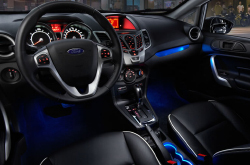 Step into the future of automotive excellence - step into a Ford. When you're prepared, the Fiesta will be here, ready to take your commands with voice-activated systems and other advanced features. 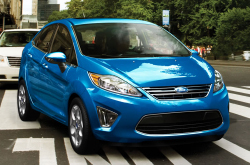 Visit Peoria Ford today and take a test drive of the 2013 Ford Fiesta at our Phoenix area dealership! You'll get to check out all of its cutting-edge features first hand, and you can see them in action during your test drive. Have fun experimenting with the trip computer, or on select trims, you can try out using voice commands. With the Fiesta's speech recognition technology, you can tell your car to play music, adjust the cabin temperature and much, much more!